This new stamp set, Undying Love, is WAY COOL..so different than anything I've seen lately! The ZOMBIE craze is in full force and this set has the BEST timing, don't you think....with Halloween coming and all of you Walking Dead fans?! Would you like to WIN the Undying Love stamp set?! Hop along and visit with the SugarPeas and guests, leaving some comment love along the way! One lucky person will be randomly selected to win the Undying Love stamp set! I stamped the lovey dovey zombies in Versamark and heat embossed them with black powder over vellum, then layered the main panel over a few Halloween themed Glitz papers and embellished with The Twinery's Baker's Twine, Pretty Pink Posh's sequins, and Reverse Confetti's Love Note hearts & Arrow Confetti Cuts. 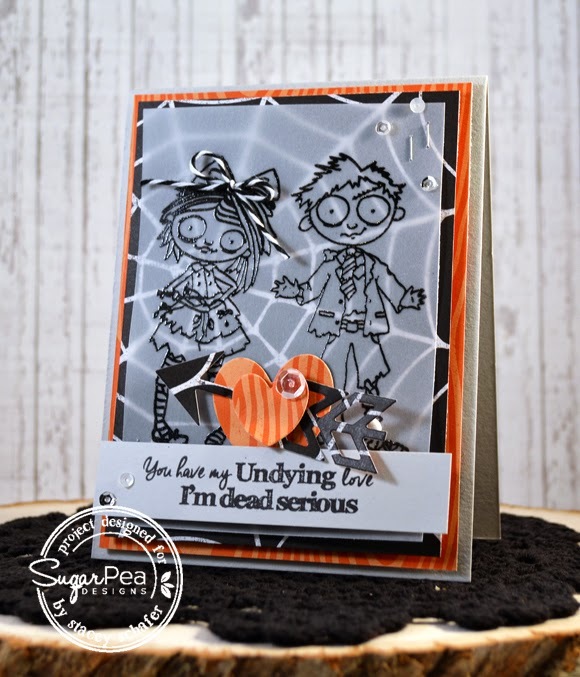 Now, you are off to see what the Sugar Pea Designers created up using the new Undying Love stamp set today! This is so cute! Love how you didn't color the little zombies. I love the colors in your card too! I love that you did the stamping on velum, super cute card! Love this cutely creepy couple!!!! Great card! Nice to see it doesn't HAVEo be colored in! These are so cute ! I love how you use the spiderweb underneath the villain it's so cute! Love your card. As soon as I saw it I heard the music from "The Twilight Zone". The spider web is like the swirl. I probably totally dated myself. Great layout. Love that these stamps are so detailed that they look great even uncolored! Love the vellum and black with the splash of color from the heart! 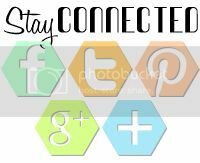 Your card is so interesting by being so different using the web. Good job. LOVE the vellum and the sentiment, fabulous card! Very cool and creative card! I love those clear bodies on the velum. What a fun card! I love the whole zombie thing!!! ok I think you are the Vellum Queen love the card..AWESOME!!! Stacey!!!! How I love what you did for these two! Another totally different way to use the zombies! Love the vellum and black embossing. It's really rather elegant, I think. Wow, what a super cool effect, I love it. Love that beautiful embossing on vellum.. Cute card!!! 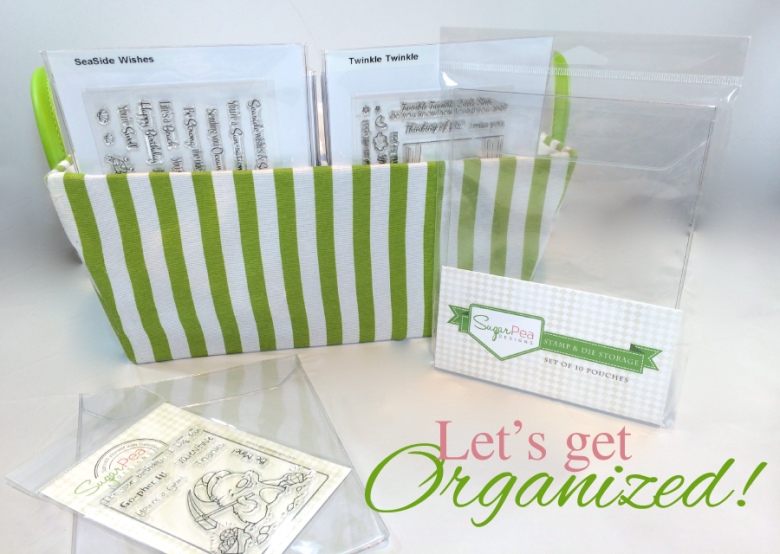 love the use of vellum! Just amazing...love the vellum and the black embossing...the sheen is fantastic! All of their details just POP with them being stamped on the vellum. I adore this!! What a good idea to emboss and not color in. Love it! ACK! I LOVE this!!! The sentiment is so funny! AWESOME card! Fun images and super cute card. Love the zombie couple. I love the embossing of these two! The vellum really makes them pop!!! The sentiment is so fun! Love your card, the embossing really makes that couple stand out! This stamp set is so awesome with those great sentiments! Fabulous creation. Love the stamping on the vellum and the orange striped heart. Whoa --- way cool!! How cool they look embossed on vellum and not colored!! Way to go - Kudos to you!!! Awesome card! Love the design you created for these zombies! TFS!